Before PaintOrThread the first blog dedicated to custom sneakers was 2000words. Ran by Kevin Moore the site updates ultimately succumbed to life’s responsibilities. Luckily some of the content was salvageable. Allowing sneaker customizers of today a way to look back on their past or to give a glimpse of what came before them. Just perfect for Sneaker Customizer Throwback Thursday. Below is an short interview from 2000words with a younger Dan GaMache of Mache Customs in 2007, with photos added by us for reference. I recently pried Mache275 from his custom lab for a quick interview. For those who don’t know him, wake up. Mache275: Dan Gamache but best known in the community as ‘MACHE’. I was a New Yorker all my life then moved to CT last fall. Pretty much I’m a guy with a graphic design degree who got bored with what was out there in terms of originality in the sneaker game and decided to to my part to try and help it. Like most of us customizers, my first customs were just basic colorway flips and as I got more comfortable, I decided to move to the more artistically challenging designs which have now become my trademark. 2k: Whats coming up for you this year? 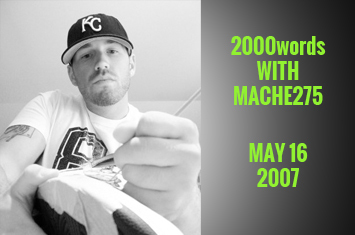 Mache275: 2007 has been a big year not only for myself but for the whole custom sneaker game as a whole. I was featured in the special AF1 issue of Sole Collector for the Rasheed Wallace AF1’s I did….I got lots of attention for those and since then, I’ve done a collab with Adidas and the NY/NJ Red Bulls of the MLS and did a few pairs of kicks for them for a charity event they co-hosted at Webster Hall in NYC…Just recently I hooked up with a new store/boutique opening up down in Fla. called ‘Neck Breakers’….I’ll be doing a lot of collab work with them in the future…Shout outs to V and Brian…..I can’t forget the Int’l Sneaker battles, I’ll be in a few of those this year to defend my title that I won last year for ‘Best Themed Custom’. 2k: proudest moment as an artist to date…. Mache275: Probably seeing Sheed holding my kicks in the SC Mag…..that was just craziness for me. Just to know that he was feeling my work great me a great sense of accomplishment. 2k: What dislikes do you have about streetwear/sneaker scene? Mache275: The fact the people are really turning into sheep, it seems like very few cats can dress themselves anymore. They need to wear whatever they are told is ‘dope’ right now. It’s so dumb what hype has done to the culture. My word to the ‘Beasts- “Don’t Believe the Hype”….wear what you like, not what everyone else tells you to. My other big gripe is the fact that kids (some, not all) will want a custom pair for me and don’t realize how much time is involved to make them. My prices are solely based on how much time is needed to complete the design plus the price of the base shoe if I end up supplying them. They’ll tell me that they want like the Sistine Chapel on an air force one or something and I’ll tell them it will be in the ballpark of $300. They then will proceed to tell me that my price is too steep and lowball me with an offer for like $100. Keep in mind that the AF1 alone is like $85. They want to pay me $15 for the 20+ hours I spent to make your shoe?! Get out of here. They have no problem going onto eBay and dropping $300 on some Spizikes or SBs that everyone and their mom will be rocking until that next limited, quickstrike thing drops next week….why not spend your hard earned money of yours on something that actually will SEPARATE you from the crowd and can say that is the only pair in the world and they were made just for you? I don’t get it. Like I said I’m not saying all the people, just the few who can’t appreciate what we customizers do. 2k: what company would you love to do a collaboration with and why? Mache275: I just want to go somewhere where I can do what I love for the rest of my life and continue to make a living off of it. It’s the American dream. It’s doesn’t matter what company, of course the big boys (Nike, Adidas, Reebok) would be high on the list….but to be totally honest, just as long as my artistic integrity wasn’t compromised, I’d work with anyone, I’m not exactly in a position to be picky right now….haha.